The second school holidays programme for gifted and talented students organised by the National PERMATApintar Centre at UKM this Nov-Dec will involve a total of 660 students including from Saudi Arabia, Indonesia, India and Brunei. This is the second end-of-year school holiday programme for such children and the first being extended to foreign students. It will be held at the UKM campus in Bangi from Nov 28 to Dec 18. Last year 405 gifted and talented children took part. Director for Permatapintar Centre, UKM, Associate Professor Dr Noriah Mohd Ishak said an overwhelming 200,000 students from national schools, national type schools, national secondary schools and national type secondary schools had applied to take part in the second camp. Four modules will be introduced this year, three from John Hopkins University (JHU), United States and one from the Institute for Solar Energy Research (SERI) UKM which will introduce them to developments about new energy sources. As part of the measures to improve the programme, the centre is sending five of its academic staff to JHU for additional training from June 26 to July 17. The centre will also send five of the alumni members selected from the first camp to take up science and mathematics courses at JHU. These students ranging in age from 13 to 15 are one each from Pahang, Negeri Sembilan and Sarawak and two from Penang. Dr Noriah hopes the experience they gained either as tutors or students will contribute to the wellbeing of the centre and UKM and be of service to the nation. The RM20 million Centere is being built and scheduled for completion by the end of the year. It will be operational early next year in time for the first group of 160 students aged 16 and 17 who will begin their academic studies at the university . The students chosen will not only follow the module set by the Centre but will also take their Sijil Pelajaran Malaysia (SPM) examinations besides the international A and O levels, Advanced Placement Test and Standard Attitude Test, the qualifications needed for entery to universities in the United States. They will also study two international communication languages besides other modules involving self-improvements and co-curriculum activities in line with local environment and current affairs. For the time being the students will be housed at the Kris Mas College until their hostel is ready. It will be built during the second phase of the Centre’s infrastructure development. The Centre is in the process to recruiting 15 teachers to teach them. A total of over 2,000 people have applied for the posts including trained and experienced teachers and those who have certain skills and expertise that could be beneficial to PERMATApintar Centre. Another programme to be launched this year is the ASASIpintar which will take in its first students beginning July. They will be selected from among those who obtained excellent results in their SPM exams recently with a minimum of 7A+. They will be selected by the Public Services Department (JPA) for the first year courses in six faculties in UKM. Their study programme involves general studies and co-curriculum as well as the first year courses selected from the Faculties of Science, Technology and Economics besides modular courses in self-help and research. At the end of the programme the students will register at either the faculties of Medicine, Dentistry, Engineering, Allied Health Science, Economics and Business or Science and Technology. This Centre is awaiting for their names from the JPA. Their intake will be handled by the Academics Management Division of UKM. Dr Noriah hopes the various programmes will not only enhance the good name of UKM and Malaysia but internationally as a resource centre known for providing excellent education to gifted children. 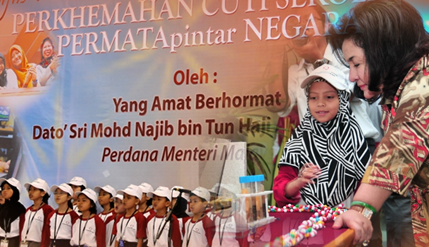 UKM, she said, is currently the only institution in the world which have a complete programme for such gifted children. She hopes the centre will be able to produce high achievers who will not only be able to contribute to the well being of society and the nation but will also enhance the good name of UKM as a producer of thinkers in science and technology. Her hope is that the programme will one day produce renowed Malaysian scientists who can win the coveted Nobel Prize.